In order to fully understand the extent of my twin story, you’ll need me to start with some of Joshua’s story. I was diagnosed with polycystic ovarian syndrome (PCOS) several years ago, but I was able to conceive Joshua through in-vitro fertilization (IVF) at UTMB. During my pregnancy, I had hyperemesis gravidarum (a severe form of nausea/vomiting) and complete placenta previa. 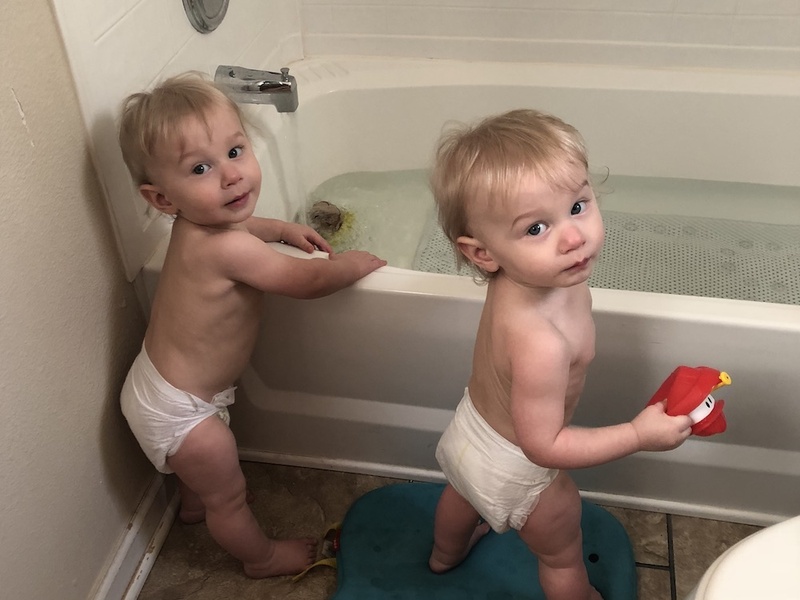 The latter cleared up on its own right before Joshua was born, but the stress from these complications, alongside IVF as a whole, left me not wanting to pursue it again for more children. We left frozen embryos from our IVF cycle, though. My husband, Keith, and I started the adoption process in Michigan. We finished the enrollment process and became a waiting family. However, we soon learned we needed to transfer to a new unit – gotta love that military life. The Coast Guard sent us a list of places we could transfer to, so we chose 30 locations and listed them in order of preference. We put Port O’Connor at the end of our list, as our adoption agency didn’t serve Texas. Our top 15 or 20 were all in states where our adoption agency served. You typically get transferred to somewhere in your top 10, so we were shocked to learn we were chosen for Port O’Connor. This news ended our adoption journey. I received a phone call from my physician at UTMB as we approached our big move. Their fertility center was shutting down, and he recommended we retrieve my embryos and seek fertility treatment elsewhere in Houston if we wanted to use them. I asked if we could see a specialist in Corpus Christi or San Antonio for convenience, but he was persistent about us seeing a particular fertility specialist in Houston. If you believe in signs from God, you’ll understand how it was impossible for us to ignore this. Keith and I talked it over for a few seconds before deciding to make a phone call for a consult with this fertility center. For us, it was a clear and immediate decision. We proceeded to do a frozen embryo transfer (FET) and ended with twins, surprisingly. We put in two embryos and by some miracle didn’t end up with triplets. I started to develop hyperemesis gravidarum about seven weeks into my pregnancy, and I was subsequently put on anti-nausea and morning sickness medication. Unfortunately, the medications weren’t enough to keep me from taking regular trips to the emergency room for IV fluids to treat my dehydration. By the time I was 11 weeks pregnant I had lost 11 pounds. I was so sick and dehydrated I had to seek hospitalization in Victoria. I was in the hospital for three days, and had to get IV fluids nearly once or twice a week until I was around 18 weeks pregnant. I saw my maternal-fetal medicine (MFM) physician at Texas Children’s Pavilion for Women around this time, right before Christmas. This routine, high-risk appointment took place on the day before we were supposed to fly to Missouri for the holidays. My physician didn’t like the way the twins’ amniotic fluid levels looked, so I was grounded from my flight and set to meet with Dr. Alireza Shamshirsaz (Shami) and Dr. Ahmed Nassr. When we met with them, they weren’t initially concerned. Joshua suffered an asthma-related breathing episode the next week, which put him in the hospital for three days. In the midst of this, I was trying to make an appointment to see my MFM physician again since it was critical to be seen for an ultrasound every two weeks for the detection of twin-to-twin transfusion syndrome (TTTS). Since it was so short notice, I couldn’t get in to see anyone at Texas Children’s in this timeframe. I eventually called my obstetrician’s office and booked an appointment with help from the nurse. I’ll never forget the look on my obstetrician’s face after that ultrasound. She was terrified and legitimately panicked. This wasn’t good, and we needed to prepare for the worst, according to her. Needless to say, I started balling my eyes out right then and there. She called Dr. Shami, who told her we could come into Texas Children’s the next morning. When Keith and I arrived at Texas Children’s we were taken to an ultrasound room. Our technician did an initial ultrasound, followed by another by Dr. Shami, Dr. Nassr and Dr. Oluyinka Olutoye. We were diagnosed with stage one of TTTS at the 20 week mark of my pregnancy. I had ultrasounds done twice a week for the next two weeks until my care team, including Dr. Jimmy Espinoza, decided it was time for the fetoscopic laser ablation surgery. During this procedure, surgeons coagulated the placental blood vessels shared between the two fetuses. The twins had a 75 percent chance of survival with the surgery, and a 90 to 100 percent chance of death without it. Luckily, the surgery was a success. I was told the average time from surgery until my water would break was 10 weeks, so I expected to deliver when I was 32 weeks pregnant. We learned the next day that the membrane between the babies had ruptured, so they were now considered monoamniotic, or “MoMo,” twins. MoMo twins have a 50 percent chance of dying at any point of the pregnancy due to cord entanglement or compression. At 27 weeks gestation, it was recommended I remain as an inpatient for the duration of my pregnancy so my medical team could monitor for complications. Thankfully, we never once had any signs of cord entanglement or compression. On April 5, 2017, I delivered the boys via cesarean section at 33 weeks and 3 days pregnant. I went into labor the night before they were born, but honestly thought I was having normal Braxton Hicks contractions at the time. They weren’t painful and they felt regular. I had promised Dr. Espinoza to get my cervix checked if I began regular contractions, so I told my nurse, Emma. We both laughed, assuming there was no way I was in labor. Turns out, we were wrong. I was definitely in labor. Dr. Espinoza was immediately summoned, and I told him Keith had just gone home for the afternoon. I wanted him there. Dr. Espinoza agreed to not deliver me within the hour and instead put me on magnesium in an attempt to slow down the contractions so Keith could make it to the hospital in time. I’ll never forget that C-section. Even though we never had an issue with cord entanglement or compression beforehand, there was a significant amount of cord entanglement during birth. By some miracle, the boys survived. The same fetal surgeons who saved their lives were all there in the operating room with us. Dr. Espinoza performed the surgery, and Dr. Shami stood next to Keith and me, giving us a play-by-play on what was happening. Dr. Nassr and Dr. Olutoye were standing there, too, waiting for the boys to be born. They both came out healthy and crying. It was amazing to have our doctors, who meant so much to us, present to share those moments. We all made it to the finish line, alive and healthy. If one thing is for sure – these babies are miracles. Thank you to everyone for your prayers during this journey! If you’re interested in learning more about Texas Children’s Fetal Center, click here.